↑ 1.0 1.1 Moghadam, Assaf (2008). The Globalization of Martyrdom: Al Qaeda, Salafi Jihad, and the Diffusion of Suicide Attacks. Johns Hopkins University. p. 48. ISBN 978-0-8018-9055-0. ↑ Livesey, Bruce (January 25, 2005). "Special Reports – The Salafist Movement: Al Qaeda's New Front". PBS Frontline. WGBH educational foundation. สืบค้นเมื่อ October 18, 2011. ↑ Geltzer, Joshua A. (2011). US Counter-Terrorism Strategy and al-Qaeda: Signalling and the Terrorist World-View (Reprint ed.). Routledge. p. 83. ISBN 978-0415664523. ↑ "Jihadists Want Global Caliphate". ThePolitic.com. July 27, 2005. สืบค้นเมื่อ October 18, 2011. ↑ Pike, John. "Al-Qaida". Globalsecurity.org. สืบค้นเมื่อ October 18, 2011. ↑ Bill Roggio (26 April 2011). "How many al Qaeda operatives are now left in Afghanistan? - Threat Matrix". Longwarjournal.org. สืบค้นเมื่อ 10 April 2014. ↑ "Al Qaeda in Afghanistan Is Attempting A Comeback". The Huffington Post. 21 October 2012. สืบค้นเมื่อ 10 April 2014. ↑ 12.0 12.1 12.2 "Al-Qaeda map: Isis, Boko Haram and other affiliates' strongholds across Africa and Asia". 12 June 2014. สืบค้นเมื่อ 29 August 2014. ↑ 13.0 13.1 13.2 "The game of terror: Al-Shabaab and Taliban are Hearts". The Washington Times. September 8, 2013. สืบค้นเมื่อ August 18, 2014. ↑ 14.0 14.1 "Al Qaeda finds base in India, Modi is on its radar". The Sunday Guardian. March 29, 2014. สืบค้นเมื่อ June 5, 2014. ↑ "Jihadist groups across globe vying for terror spotlight". Fox News. 10 July 2014. สืบค้นเมื่อ 7 January 2015. ↑ 16.0 16.1 Jenkins, Brian Michael (2014). ﻿The Dynamics of Syria's Civil War﻿ (รายงาน). RAND Corporation. http://www.rand.org/content/dam/rand/pubs/perspectives/PE100/PE115/RAND_PE115.pdf. ↑ Idiz, Semih (June 10, 2014). "Why is Jabhat al-Nusra no longer useful to Turkey?". Al-Monitor. ↑ "Airstrikes in Syria That Targeted Khorasan Group Disrupted Plots Against US, Gen. Dempsey Says". ABC News. 7 October 2014. สืบค้นเมื่อ 10 October 2014. ↑ "AP sources: IS, al-Qaida reach accord in Syria". 2014-11-13. สืบค้นเมื่อ 2014-11-13. ↑ "Security Council Resolutions Related to the Work of the Committee Established Pursuant to Resolution 1267 (1999) Concerning Al-Qaida and the Taliban and Associated Individuals and Entities". United Nations Security Council. Archived from the original on January 12, 2007. สืบค้นเมื่อ January 9, 2007. ↑ United States Department of State. "Foreign Terrorist Organizations (FTOs)". Archived from the original on June 28, 2006. สืบค้นเมื่อ July 3, 2006. ↑ United Kingdom Home Office. "Proscribed terrorist groups" (PDF). Archived from the original on June 30, 2006. สืบค้นเมื่อ July 3, 2006. ↑ General Intelligence and Security Service. "Annual Report 2004" (PDF). Archived (PDF) from the original on June 14, 2007. สืบค้นเมื่อ June 11, 2007. ↑ Commission of the European Communities (October 20, 2004). "Communication from the Commission to the Council and the European Parliament" (DOC). Archived from the original on June 14, 2007. สืบค้นเมื่อ June 11, 2007. ↑ "Criminal Justice (Terrorist Offences) Act 2005". 2005. Department of Justice Ireland. สืบค้นเมื่อ May 26, 2014. ↑ Bill Roggio (September 4, 2011). "How many al Qaeda fighters are in Afghanistan again? – Threat Matrix". Longwarjournal.org. สืบค้นเมื่อ August 18, 2014. ↑ "The Hindu : Centre bans Al-Qaeda". Hinduonnet.com. April 9, 2002. สืบค้นเมื่อ March 22, 2010. ↑ "Russia Outlaws 17 Terror Groups; Hamas, Hezbollah Not Included". Archived from the original on November 14, 2006. ↑ Alfredo Sirkis. "O Brasil e o terrorismo internacional". สืบค้นเมื่อ February 22, 2014. ↑ Diplomatic Bluebook (2002). "B. Terrorist Attacks in the United States and the Fight Against Terrorism" (PDF). Archived (PDF) from the original on June 14, 2007. สืบค้นเมื่อ June 11, 2007. ↑ Korean Foreign Ministry (August 14, 2007). "Seoul confirms release of two Korean hostages in Afghanistan". Archived from the original on December 15, 2007. สืบค้นเมื่อ September 16, 2007. ↑ "Summary of indictments against Al-Qaeda terrorists in Samaria". Israel Ministry of Foreign Affairs. March 21, 2006. สืบค้นเมื่อ May 4, 2011. ↑ Mortada, Radwan (May 19, 2014). "Hezbollah fighters and the "jihadis:" Mad, drugged, homicidal, and hungry". al-Akhbar English. สืบค้นเมื่อ June 9, 2014. ↑ "Bill Moyers Journal. A Brief History of Al Qaeda". PBS.com. July 27, 2007. สืบค้นเมื่อ March 31, 2012. ↑ United States v. Usama bin Laden et al. , Cr. 1023, Testimony of Jamal Ahmed Mohamed al-Fadl (SDNY February 6, 2001). ↑ "Al-Qaeda's origins and links". BBC News. July 20, 2004. สืบค้นเมื่อ June 3, 2014. ↑ Cooley, John K. (Spring 2003). "Unholy Wars: Afghanistan, America and International Terrorism" (reprint). Demokratizatsiya. Naím, Moisés (January–February 2003). "The Five Wars of Globalization". Foreign Policy (134): 28–37. ↑ "Middle East | Wahhabi opponent killed in Iran". BBC News. June 26, 2007. สืบค้นเมื่อ August 18, 2014. ↑ "Dreaming of a caliphate". The Economist. August 6, 2011. สืบค้นเมื่อ May 19, 2012. ↑ Ranstorp, Magnus (2009). Unconventional Weapons and International Terrorism. Routledge. p. 33. ISBN 978-0-415-48439-8. ↑ Lawrence Wright (2006). 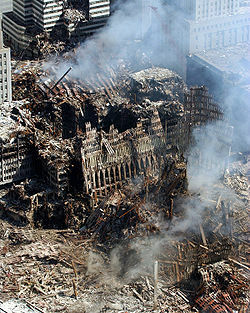 The Looming Tower: Al-Qaeda and the Road to 9/11. Knopf. p. 246. ISBN 0-375-41486-X. ↑ "How the CIA created Osama bin Laden". Green Left Weekly. 2001-09-19. สืบค้นเมื่อ 2007-01-09. ↑ "1986-1992: CIA and British Recruit and Train Militants Worldwide to Help Fight Afghan War". Cooperative Research History Commons. สืบค้นเมื่อ 2007-01-09. ↑ "Osama bin Laden: A Chronology of His Political Life". PBS. สืบค้นเมื่อ 2007-01-12. ↑ "Bin Laden's Fatwa". Al Quds Al Arabi. August 1996. สืบค้นเมื่อ 2007-01-09. ↑ สรุปจากการสัมภาษณ์บิน ลาดิน เมื่อ 26 พ.ค. 2541 โดย John Miller Most recently broadcast in the documentary Age of Terror, part 4, with translations checked by Barry Purkis (archive researcher). ↑ Weir, Shelagh (July/September 1997), A Clash of Fundamentalisms: Wahhabism in Yemen, Middle East Report (204), Middle East Research and Information Project, สืบค้นเมื่อ 2009-01-19 Check date values in: |publication-date= (help); cited in Burke, Jason (2003). Al-Qaeda: Casting a Shadow of Terror. New York: I.B. Tauris. pp. 128–129. ISBN 1850433968. U.S. Dept. of Justice, Al Qaeda Training Manual. หน้านี้แก้ไขล่าสุดเมื่อวันที่ 24 กุมภาพันธ์ 2562 เวลา 23:47 น.